chronicles murderous murderers making mayhem through manslaughter and pandemonium from the point of view of police officers and witnesses! 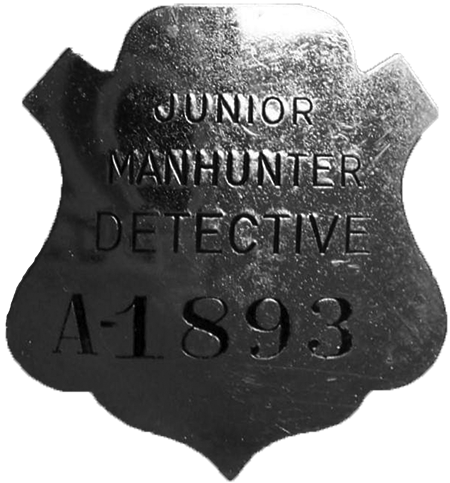 No manhunt had begun… yet"
There's a manhunt for murderous murderers making mayhem through manslaughter and pandemonium! Some murder for money, some murder for love, some murder for hate, some murder for the thrill, but each will be brought to justice under the law. Manhunt chronicles a murder and manhunt from the point of view of police officers, witnesses, and more in a quarter-hour format. Each episode begins with the murder or the finding of a dead body. Police officers then piece back the clues to discover the murder. Listeners learn what clue points officers toward the guilty murderer. See also: Wanted and Confession. For true police stories see also Dragnet, Tales of the Texas Ranger, Confession, Did Justice Triumph, Official Detective, Border Patrol, Up for Parole, Calling All Cars, Call the Police, Honor the Law, Wanted, and Unit 99. 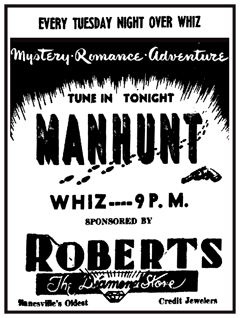 I remember getting a a Warner Lester Manhunter badge from WXYZ radio in Detroit. The nickel plated brass badge came pinned a membership card and was sent in an envelope. First issued around 1932, a year before the first Lone Ranger broadcast! This is likely the first WXYZ character premium! The show became popular and picked up Broadcast Corned Beef Hash as sponsor around 1933. Another identical badge (except for the number) was issued, this time with a different membership card. There is a Green Hornet association regarding Warner Lester. Jim Irwin played Mike Axford on Warner Lester until around 1934 then the same character was included on the Green Hornet radio show.